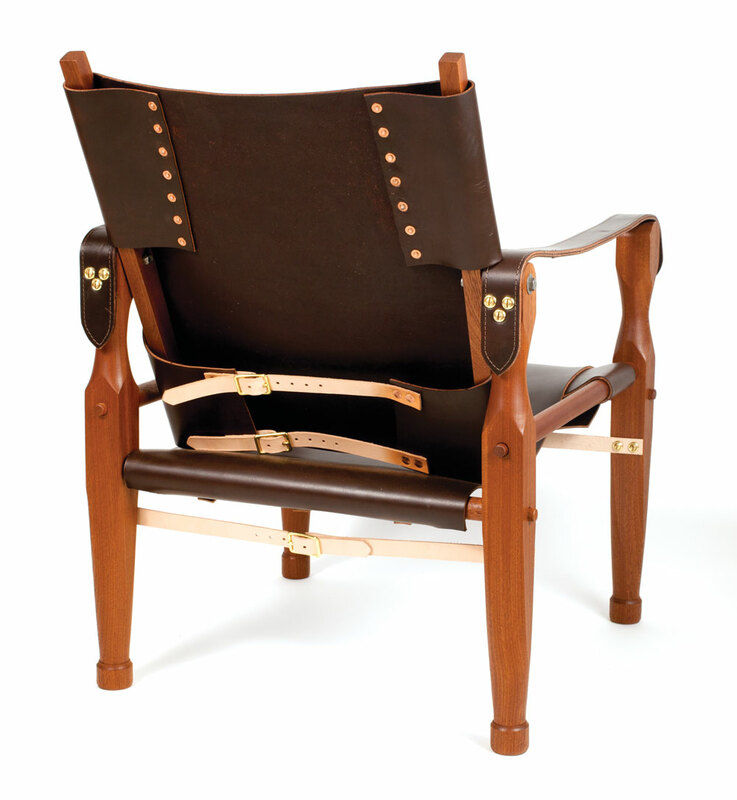 Because the Roorkee chair has leatherwork and turning, many woodworkers ask me about the basic toolset needed to build one of these chairs. When I teach a class in making a Roorkee chair, here is the core set I recommend. 1. Full-size Easy Rougher from EasyWood Tools with an R4 cutter. I am not a turner. I am a furniture maker who turns. So when I teach turning, I look for the easiest path. With the EasyWood tool I don’t have to teach sharpening. And I have to teach only one grip on the tool. This one tool does all the cuts on the chair, and it does an excellent job. The full-size version costs more than the smaller versions, but I find the bigger tools easier for beginners to use. These tools are available everywhere, but I prefer to buy direct from the maker because it puts more money in their pocket. 2. If you plan to make more of these chairs, I recommend you buy the Veritas 5/8” Tapered Tenon Cutter. You can cut the taper on the lathe, but this pencil-sharpener-like device ensures your tenon will be a perfect fit in your socket every time. 3. The tapered hole is made using the Veritas Large Standard Taper Reamer. I prefer the less-expensive standard version because it can be used in a brace, electric drill or drill press. The more expensive professional reamer is used in a brace only. To finish the woodwork part of the project, you’ll need some drill bits (1/16” up to 5/8”), marking and measuring tools, screwdrivers and a block plane (or sandpaper) to clean up the flat sections of the legs. The leather can look daunting, but it actually is quite easy and is accomplished with just a few tools. 4. For cutting the leather, I recommend a sharp utility knife (be sure to buy some of the heavy replacement blades). Any utility knife will do, though I don’t recommend the spring-loaded ones where you have to press the blade out continuously during the cut. That kills your thumb. I touch up the cutting edge of my utility blades on my sharpening stones or a strop. I can usually cut out two or three chairs on one blade. 5. To punch holes for the belting and rivets, I recommend the Tandy Mini Punch Set. I have a nice rotary punch, but this inexpensive set gets you started at a small fraction of the price of a good rotary punch. 6. When punching holes, you’ll need a mallet and a backing board. With leather, I prefer to use an old poly cutting board as the backing board. 7. To set the rivets, you’ll need a rivet setter. Because I use No. 9 copper rivets, I recommend the No. 9 Craftool Rivet and Burr Setter, also from Tandy. You’ll also need a tool to snip the the rivets to finished length. I use my nippers, which work well. If you get deep into the leather work, you’ll find there are a lot of tools you can buy that will simplify and automate a lot of the processes (such as specialized punches that make the decorative belting ends). If you want to buy one extra tool to make your life easier, get the Craftool Strap Cutter. It cuts straps and belts with astonishing speed and can save you an hour of time on each chair. I would shoot a new one, but I’ve sold all my Roorkees…. 5/8″ tapered tenon cutter is out of stock until Sept 2014. Any alternatives, other than buying a lathe? Thank you for sharing the tool list, especially for leather. I was wondering about basic leather tools for stitching?? The above gets me brass, buckles, and holes, but what about sewing? I purchased the basic handstitching kit. I did pre-punch my stitch holes with a standard round awl though. With my sewing skills being what they are this was a good idea anyway just to keep a straight line while sewing. I used some scrap cedar fencing for my backing board. Also where I’ve purchased all my leather and #9 rivets for the chairs I’ve made. Nice roundup of the basic Roorkee tools! I’ve built three of these chairs now based on your original article and blog post updates and enthusiastically second your recommendation of the Easy Rougher for this project! I did my first chair with standard lathe tools and found a few of the cuts a bit harrowing (esp. with the skew, my nemesis) but whipped through the other two using the Easy Rougher without breaking a sweat. Easy Wood Tools really is a game changer for furniture makers that turn and a bargain at twice the price IMO. 1) What Lathe do *you* use for making this chair? 2) What’s the minimum specs on a lathe someone could get away with to build this chair. I have a Jet Midi lathe with a bed extension. Any lathe that can take 23″ between centers (the length of the stretchers) can handle a Roorkee. And I mean *any* lathe. Furniture makers don’t need a fancy lathe (but you can have one if you like…).